This is a device that takes a thermocouple temperature input, converts it into a digital value, and then spits out the temperature on a serial port, which you can then feed into a computer, or another microcontroller. This is a useful device for any time when you want to be able to monitor or log a temperature. This also happens to be my very first circuit board design This means after designing the circuit I wanted, I entered it into a PCB design tool (Eagle), and then laid out where I wanted each copper trace, solder point, and all the white text I wanted printed on the board. I then emailed the board files to Laen, and two weeks later I got these professionally fabricated PCBs back in the mail, for only $9.90 for the three copies. How it works, is that a thermocouple screws into the two screw terminals on the right of the board (It's shown with three terminals, because that's all I happened to have in stock), a Maxim MAX31855 chip converts the signal coming out of the thermocouple into a digital temperature, which is then shifted over to the ATTiny2313 microcontroller (which is the bigger of the two ICs), which then processes the temperature and spits it out the serial port on the left. The serial port is at 3.3V levels, not RS-232, but can be plugged into any FTDI USB adapter to be fed into a computer, since it follows the 6 pin TTL serial port standard. The Maxim ADC comes in different flavors for each type of thermocouple, so even though I'm using it for K type thermocouples, changing it to use another type is nothing more than physically changing the 8 pin chip on the board. 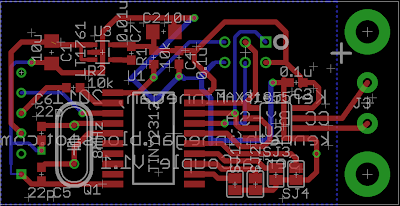 For a first prototype, the PCB turned out pretty well. I got about half the silkscreen on the wrong layer, so my name, website, and some of the part labels didn't print, and the 6 pin serial port header holes are too small, so they had to be surface tacked on. 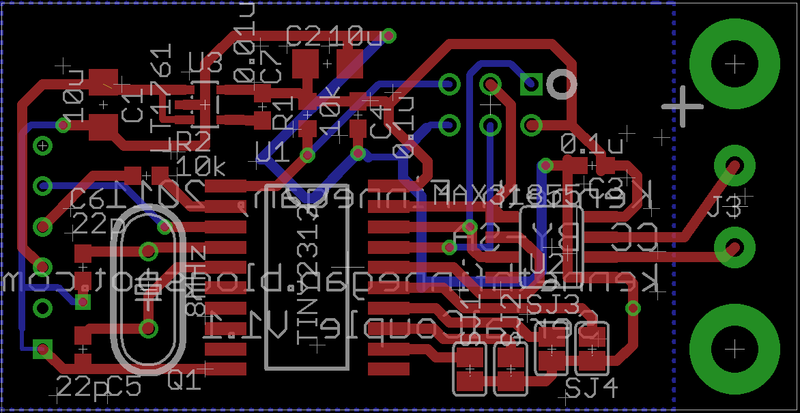 All-in-all, its good enough to start working on the software for it before I spin a second revision of it. A demo of the first working prototypes can be seen here. Project files will be uploaded and documented on the project page. And notice that many of these parts, particularly the passives, are very useful to have in stock, so where the list asks for eight 0.1μF caps, I would order 100. Hope this list is helpful.